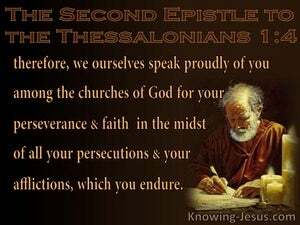 ﻿ 2 Thessalonians 1:4 therefore, we ourselves speak proudly of you among the churches of God for your perseverance and faith in the midst of all your persecutions and afflictions which you endure. Therefore we ourselves boast about you among God's churches-about your endurance and faith in all the persecutions and afflictions you endure. As a result, we rejoice about you among God's churches about your endurance and faith through all the persecutions and afflictions you are experiencing. And this is a cause of our mentioning you with pride among the churches (assemblies) of God for your steadfastness (your unflinching endurance and patience) and your firm faith in the midst of all the persecutions and crushing distresses and afflictions under which you are holding up. Therefore, we ourselves speak proudly about you among the churches of God because of your steadfastness and faith amid all the persecutions and afflictions that you are enduring. Therefore we ourselves boast of you among the churches of God for your perseverance and faith in all your persecutions and in the afflictions which you are enduring. As a result, we ourselves speak of you with pride in the churches of God for your steadfastness and faith in the face of all the persecutions and troubles you are having to endure. so much so that we ourselves glory in you in the churches of God, for your patience and faith in all your persecutions and tribulations which you endure. So much so, that throughout the churches of God we are proud of you, proud of the stedfastness and faith you display through all the persecutions and the troubles in which you are involved. So that I myself am boasting about you among the churches of God, boasting of the stedfastness and faith which you are displaying in all the troubles and afflictions which you are enduring. 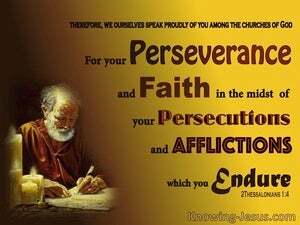 As a result we ourselves boast about you in the churches of God for your perseverance and faith in all the persecutions and afflictions you are enduring. so that we ourselves boast about you in the churches of God for your patience and faith in all your persecutions and in the afflictions which you endure. So much is this the case that we ourselves speak with pride, before the Churches of God, of the patience and faith which you have shown, in spite of all the persecutions and troubles that you are enduring. so that we are always boasting of you among the churches of God for your patient endurance and faith, in spite of your persecutions and crushing sorrows which you are enduring. so that we ourselves boast of you among the churches of God, for your patience and faith under all your persecutions and afflictions which ye endure. 3 We ought always to give thanks to God for you, brethren, as is only fitting, because your faith is greatly enlarged, and the love of each one of you toward one another grows ever greater; 4 therefore, we ourselves speak proudly of you among the churches of God for your perseverance and faith in the midst of all your persecutions and afflictions which you endure. 5 This is a plain indication of God's righteous judgment so that you will be considered worthy of the kingdom of God, for which indeed you are suffering. otherwise if any Macedonians come with me and find you unprepared, we--not to speak of you--will be put to shame by this confidence.